Can you really achieve inbox zero? Is inbox zero really achievable? Just a couple of years ago in 2015, we all received an average of 205 emails per day. The prediction is that by the end of 2018 that will have grown to 236 emails a day and by the time the UK leaves Europe in 2019 it will be 247 emails per day ((https://www.radicati.com/wp/wp-content/uploads/2015/02/Email-Statistics-Report-2015-2019-Executive-Summary.pdf)). That’s around another 25 emails a day than you were getting last year. Every day, seven days a week. This year you will have another 9,000 emails to cope with compared with the previous year, and it is only going to get worse. Email growth rates are high; this year alone the number of email accounts on the Internet is expected to go up by 7%, yet we will still have the same number of accounts per person. So there will just be more and more email users pumping out more and more emails. Have fun. Not only is this an issue, but the time we are spending on email is going up and up. Nowadays, we spend 28% of our working day on email. That’s almost three hours per day. For every minute you spend on dealing with email, it takes at least another minute to get back to work. That means if you are spending up to three hours a day on processing emails, you are spending another three hours a day doing nothing as your brain attempts to switch back to work. It is pushing productive work into around two hours a day. A recent analysis from the Bank of England suggests that static productivity in the economy is linked to the use of the Internet, in particular through smartphones. That’s something I have been teaching my university students for the past five years. Kind of the Bank of England to catch up with me….! The fact is, email is an illusion. It makes us think we are working because we appear to spend time “doing something”. In reality, though, the “doing” has little to do with actual work. Indeed, evidence from several studies shows that 62% of the emails in a typical inbox are irrelevant to the user. And that doesn’t mean they are spam. I am talking here about the filtered email that ends up in the inbox – the material that is supposedly what the user wants to see. Most of it is time-wasting stuff. You know the kind of thing – emails that people think you ought to see, emails you are copied-in on “just in case”, and emails from people who you once thought would be useful to you but now…..well, maybe not. Hidden away in the 240 emails you get each day is around a dozen or so that are really important and valuable. You can try to use filters to sort out the wheat from the chaff, but guess what happens when people do that? Yes, they look in all the places where the filters put things “just in case”. Consider what would happen with the physical post. There is material within the postal system that could be useful to you. But it is filtered out. Some of it goes into someone else’s postbox. Some of it doesn’t even reach your street. But, it is potentially useful to you. If we carry over the filter system from email to the world of the physical post, this would mean that now and then you would pop next door to rummage through their letters to see what you had missed. Similarly, once a month you’d pop over to the other side of town to go through all the mail delivered to a different street – just in case there was anything useful for you. Of course, this is madness. Yet that is precisely what millions of people are doing each day with email. They filter out messages, so they go into a special folder, and then head off to those folders “just to see”. It’s bonkers. What is at play here is the psychology of the “fear of missing out” (FOMO). You do not fear missing out on the physical post delivered to your neighbours because you are not aware of its existence. But if you were, if you saw those envelopes, you’d start to wonder what was inside. Curiosity gets us. With email, we do know about the existence of the messages, so we start to get curious and wonder, and then we worry about missing out if we don’t open the messages. And then we end up spending more time on email, getting frustrated and angry, leading to longer working hours, more stress and less focus on productive tasks. Inbox zero is the idea that each day you can have an empty inbox. You can’t. Stop fussing about it. Here’s why you can’t. Your inbox on your computer may be empty, but what about that inbox in your mind? What about the fact that you know emails have been filtered and filed away? What about knowing that if only you refreshed your email window, you’d get some more messages? What about the worry that colleagues or customers will email you and you’ll miss out if your inbox is so controlled? People may have an inbox with nothing in it, but their mind is still in email mode. The issue is not with the inbox and sophisticated technological management tools we can use to control our email system. The problem is the way we think about and use email. The problem is in our heads, so that’s where we need to begin if we are to solve the difficulties we all face. As the statistics show, email is not going away anytime soon. It is going to grow, and we are going to have to cope with it. Even with complex filters and additional software, email will remain a cumbersome and difficult system. So, we need to rethink the way we use it. The real problem is like that of an addict. We never know when we are going to get our “next fix”. As a result, we dip in and out of email to satisfy our growing “FOMO” thinking. But consider an entirely different issue. Think about brushing your teeth. You know that proper dental hygiene avoids decay and gum disease. It also reduces the need for scary visits to dental surgeons. You are hooked on cleaning your teeth because you want to look good, feel good, smell good and avoid dental issues. Yet do you worry every few minutes “have I cleaned my teeth”? Do you keep popping into the bathroom to give your pearly whites a quick brush, “just in case”? No. You don’t do that. Instead, you clean your teeth every morning and every night. You have a routine, and you have been doing this daily ritual for as long as you can recall. Your brain doesn’t have a fear of missing out on teeth cleaning because the daily morning and night habit reassures your subconscious as to when your next fix will be. The first step to establishing a better and more productive use of email is to set a routine. And stick to it. It doesn’t matter whether you have an extreme routine, such as Tim Ferris’s once every ten days, or once every three hours, having a routine means your brain will start to recognise what is going on. It will take about 30 days of sticking to your routine, but eventually, your subconscious will gather that your brain will get its fix of email, so it will no longer prompt you to keep looking. Your routine will only work, though, if you switch off all email notifications, on your desktop and on your mobile devices. Otherwise, your brain will get a trigger to start worrying. The second step in getting a grip on email is to let everyone know about your routine. Use an autoresponder to let every person who sends you an email know when you will respond. Place a notice on your contact page, if you have one, or your profile page, saying when you deal with emails. Get in touch with colleagues, suppliers and customers to let them know when you will deal with messages. The other day I was running a masterclass for chief executives when I suggested people establish routines like this and let people know about them. One of the CEOs said, “that’s impossible”. When I asked why I was told it was due to the fact that people sent emails and expected an answer pretty much straight away. That’s true, but it’s because they have no idea when their next “fix” of email is going to come either. So they send emails when they think about it, or get a chance. Then they expect a prompt reply. When you set a routine and let people know about it you are helping them, not hindering them. That’s because you have managed their expectations. Nobody’s email is so important it cannot wait a few hours for an answer. 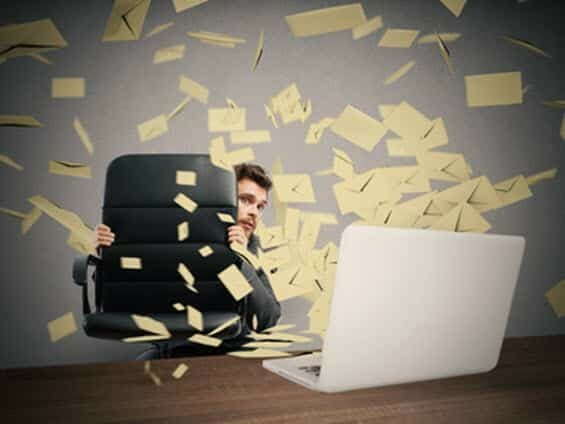 The reason we expect instant answers to email messages is because that’s what we all do, as we run around dealing with messages when we would be more productive NOT dealing with them. Nobody’s email is so important it cannot wait a few hours for an answer. You are draining your productivity if you try to answer emails quickly. Use something like Gmelius or Boomerang to schedule your emails. Send out your emails, so they arrive in the inboxes of your recipients about an hour before your email working routine. That way they will probably reply while you are doing email. That means you will not be interrupted as often. Furthermore, people will get used to receiving emails from you at specific times, which means they will get an idea of when you are working. They will adapt their behaviour accordingly, improving the way they use email with you. True, it takes time, but generally, habits like this take around 30-60 days to get established. So, stick with it; keep your schedule going, even if you feel it is having no impact. Give it time and it will. A programme like Gmelius can provide you with templates, or you can use “canned responses” to quickly insert email content. Many people spend days each year typing the same old stuff, time after time. That’s a drain on productivity. However, our brains perceive it as work, so we think we are being productive when we are not. You can also get other email automation systems to reduce the amount of work you do with email. That will have an impact on your subconscious as you will stop seeing much email activity as “work”. Routines, managing expectations, scheduling and automation, will revolutionise email for many people. It will not achieve “inbox zero”. However, it will change the way you think about email, which is ultimately better than striving for an empty inbox which is not actually possible. Do you really need to be “number one”?